Through our Community Speakers Program we hope to inspire and inform the Sydney metropolitan community about people seeking asylum. The program has been developed in response to ongoing community organisation, school and group requests to learn more about how they can become involved and provide support. We welcome requests for speakers from all parts of the community. We do work a lot behind the scenes to make sure that the programs brings all the answers to your questions. We review the content regularly and our volunteer speakers prepare extensively before presenting to you. 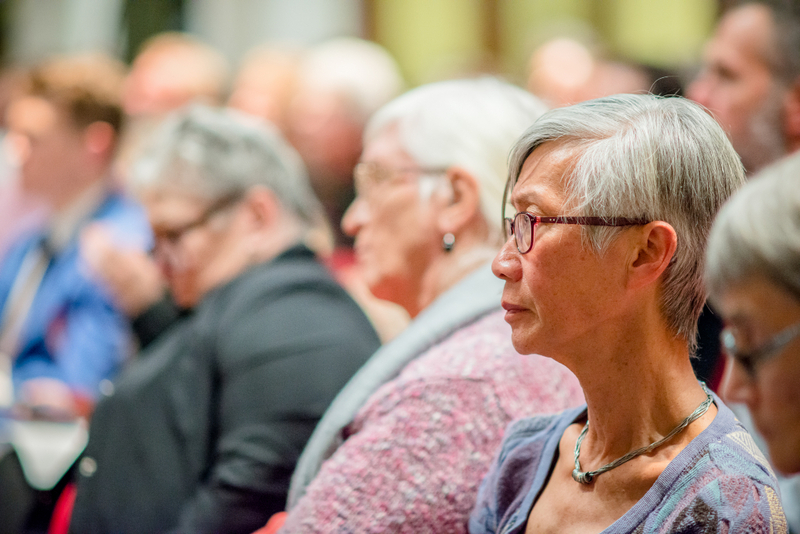 Although our presentations are free of charge, we ask you to kindly consider supporting people seeking asylum and ASC’s work by making a donation. You can make a financial donation, sign up to become a regular donor or donate food, toiletries or lap tops. Seeking asylum is a human right. The Asylum Seekers Centre advocates for a policy that recognises the rights of people seeking asylum and provides a welcoming and supportive environment. We cannot do this alone. The support of the wider community is what allows us to assist the growing number of people who need our help. Together we can celebrate the valuable contributions that people seeking asylum bring, and as a community, we can help them rebuild their lives. How will it help to increase community awareness and support of people seeking asylum? Who are our community speakers? Are concerned about the unfair treatment of people seeking asylum. Would like to have a better understanding of why people seeking asylum flee their countries, the process of seeking asylum and the personal challenges they face while they wait for their applications to be assessed. Would like to better understand how the Asylum Seekers Centre supports people seeking asylum living in the community. Would like to know how they can provide support. 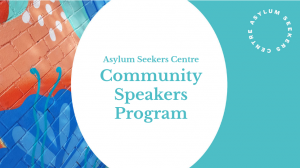 How will the Community Speakers Program help to increase community awareness and support of people seeking asylum? Access to factual information is a fundamental element of a harmonious community. By delivering community presentations we hope to open the eyes of the community to the many ways that people seeking asylum and refugees contribute to Australia’s diverse and multicultural community. Inform the community of the key facts and issues that are so often missing or misrepresented in the public debate. Increase community awareness and understanding of people seeking asylum, who they are, why they flee their home countries and the challenges they face whilst seeking asylum. Challenge negative perceptions and myths and encourage people to think about social justice issues and Australia’s humanitarian obligations towards people seeking asylum. Promote positive perceptions of the valuable contribution that people seeking asylum bring to the Australian community. Enhance community understanding of the Centre’s role in helping people seeking asylum living in NSW. Provide information and advice on how community groups and individuals can support people seeking asylum whilst they rebuild their lives. Talk about ASC in your organisation’s newsletter or bulletin. Encourage people to sign up to the Asylum Seekers Centre’s newsletter. Sign up to become a regular donor and help keep our doors open so we can continue to provide support to people seeking asylum. We have a network of community speakers who come from a wide range of professional backgrounds. They have been specially recruited to talk to the community about people seeking asylum and the work of the Centre. A handout on ‘How Can You Help?’ is also available for how students and schools can support people seeking asylum in fun and creative ways. Presentations are typically 30 minutes in duration, which includes time for a Q&A but can be tailored to meet the specific needs of your audience. We recommend booking a speaker at least one month prior to your event. Book a speaker here. Our program runs across the Sydney metropolitan area only. Find out more about other ways that you can support the work of the Asylum Seekers Centre.